The RBC55 replacement battery set contains two battery packs. This is the complete set to replace the SUA2200, SUA2200I. 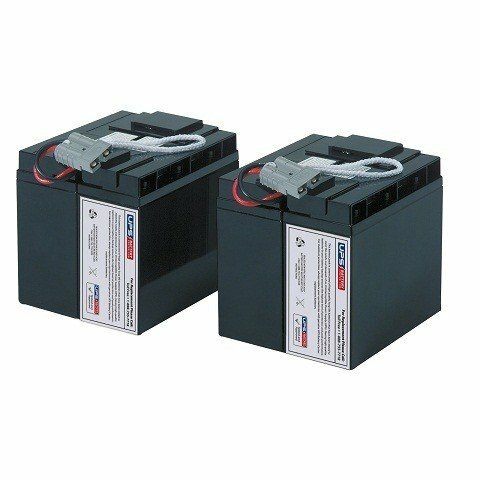 The replacement battery set is made of high quality UPS Rated batteries that are designed to provide excellent performance and long life in battery backup applications. This battery set meets and exceeds original manufacturer's specifications. Our batteries are new and always fresh stock. The RBC55 battery set is covered by our industry leading 1 year replacement warranty. The RBC55 battery set is complete, no assembly of the battery pack is required. Installation is easy, plug and play. The SUA2200, SUA2200I offers hot swap functionality, there's no need to shut down the UPS during battery replacement. This premium battery pack will restore performance and renew the reliability of your UPS. Guaranteed compatibility with: SUA2200, SUA2200I.